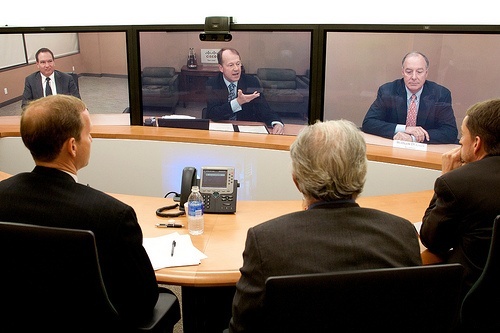 What’s On Tap for the Videoconferencing Industry? Video collaboration is changing traditional business practices and what it means to be an employee. Here’s what the future holds for videoconferencing. Conference rooms are fast becoming virtual and visual. As businesses become mobile and practices like telecommuting and BYOD (bring your own device) become the norm, meetings are becoming mobile, and moving on-screen. Videoconferencing is changing the traditional look of conference rooms, pushing dedicated equipment, networks, and rooms into oblivion. However, it does pay to give some thought to what the future holds for this effective communication medium. As organizations begin adopting new workplace models, a plethora of change drivers have emerged. These drivers or motivators are not only altering the traditional work setup, but are also transforming overall company culture. For instance, today’s modern employees are more mobile, social, and geographically distributed, and keeping them tied to their desks hampers the productivity of this new breed of employee. And with wearables, tablets, smartphones and “smart” watches becoming the norm, videoconferencing solutions are gearing up to fully support these changes—and these devices— in order to remain relevant and useful. In our high tech, extremely mobile world, business conversations are defined by subjects like the deployment of mobile strategies, video collaboration systems, telepresence, huddle rooms, HD, and other opportunities to develop seamless remote working opportunities. All of these conversations, and all have this change, has spurred a quick evolution of modern videoconferencing solutions. Organizations today are frequently moving to the cloud. Most enterprises deploy a private-public hybrid network system and extend their reach beyond the firewall. Videoconferencing has the flexibility to can scale up (or down) to include these various endpoints within the enterprise network. Now, participants from anywhere can join meetings using different cloud-based applications, which increases flexibility and enhances productivity. People no longer have to make sure they can get to a certain room to be a part of a video collaboration session. Videoconferencing solutions are also exploring the endless possibilities afforded by 3D technology. Some will employ the traditional 3D glasses to participate, but other developments will treat it much like any other screen. With an increase in bandwidth and more focus on content, 3D systems will hone in on vertical applications like CAD and molecular modelling, paving the way for an even greater reach. Also, advances in 3D imaging will prove particularly helpful for telemedicine in the future. Videoconferencing will break away from the traditional practices of confining meetings within four walls. To keep pace with the ever-growing mobile workforce, sophisticated web cams and advanced video coding will enhance portability. This is a significant development from the traditional AV carts we all remember being used for so many years. With its latest features a, videoconferencing is offering more effective ways for communication between people through various endpoints, such as smartphones, tablets, laptops and desktops. This flexibility allows meetings and collaboration to occur outside the traditional boardroom, and even across the globe. The need for portability is driving the evolution of business videoconferencing. Some innovations include web-based clients, desktop solutions with Wi-Fi-connectivity, telepresence systems, 4G network connections, and video-enabled mobile devices. Plus, wheeled robots complete with video screens attached are yet another example of the groundbreaking developments on the horizon for videoconferencing. As bandwidth increases and cost decreases, enterprises are adopting and embracing videoconferencing. With incredible audio and video quality, mobile integration, and content-specific approach to meetings virtual teams are building new definitions of business productivity.